Wondering how to put the biggest smile on your teenager’s face? 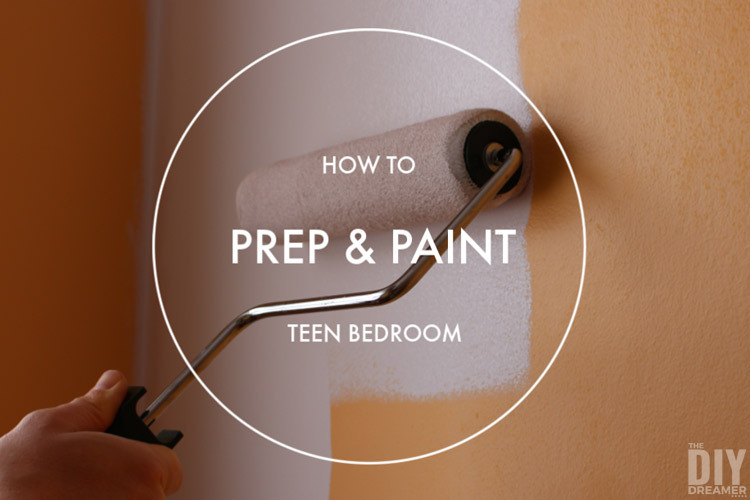 Tell them that you will be giving their bedroom a makeover! BONUS: Tell them they can choose the bedroom colors too! When I got pregnant with Gabrielle I knew right away I wanted her nursery to be a jungle theme. 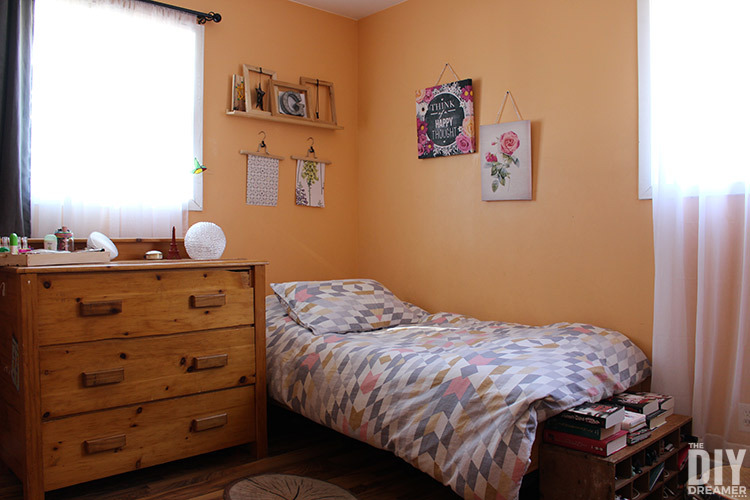 We painted her bedroom bright orange. How I loved that color! So cheerful and fun! When we moved to our current home, she was only 1 and still using her crib. We decided to paint her new bedroom the same bright orange and keep all her current decor. Fast forward many years, she’s 12 and still has bright orange as her bedroom color. Oups! She asked on several occasions for us to repaint her room, however we kept putting it off because we need to change the windows in her room. We wanted to change the windows and repair the walls (if they needed repair) before we painted her bedroom. A few weeks ago, Sébastien and I were discussing Gabrielle’s bedroom and decided it was time to do something with it. We aren’t ready to change the windows yet (we have the roof of our house to do this summer), but figure we can just fix around the windows once we do change them. 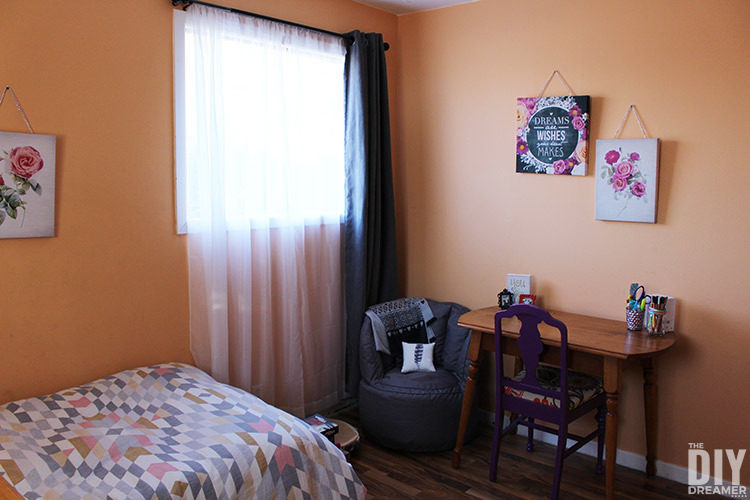 You should have seen Gabrielle’s facial expression when we told her we would be giving her bedroom a makeover! Well, to be honest it took her a few minutes to realize we weren’t pulling her leg. hehe Poor thing! Once she realized it was true, she was OVER THE MOON!!! Right away she started telling us the different ideas she had for her room and even started a Pinterest board with inspiration. hehe You can follow me on Pinterest to see some of the inspiration. 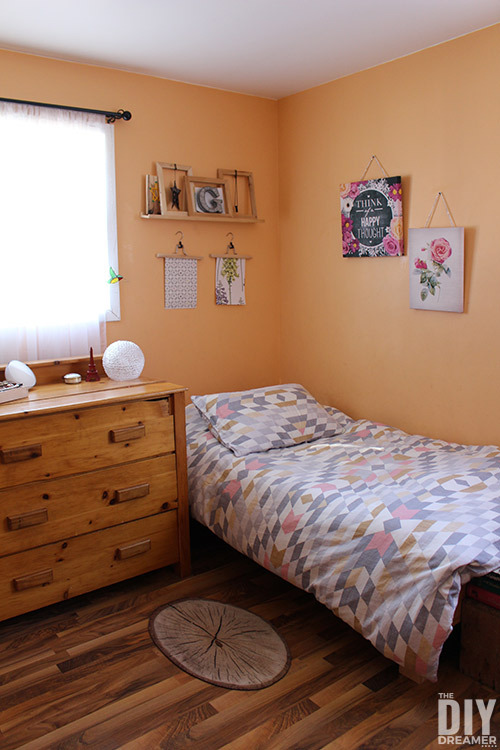 For years she asked for her bedroom to be purple, I even wrote a post about it many years ago: Purple Bedroom Inspiration. I also fixed up an old chair and painted it purple for her. Now that it was really happening, she decided to go away from purple (It might be because she’s older now. hehe). She’s leaning more towards gray with a purple undertone. We headed out to the hardware store and browsed through their paint colors. Gabrielle had so much fun grabbing colors that inspired her (her words hehe). 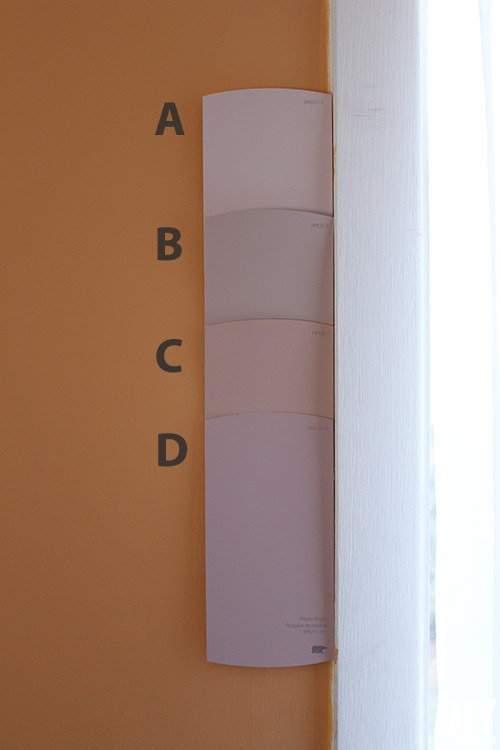 We came back home with a few paint samples of the bedroom colors she liked the most. We used washi tape to hang the bedroom colors she chose on one of her bedroom walls. 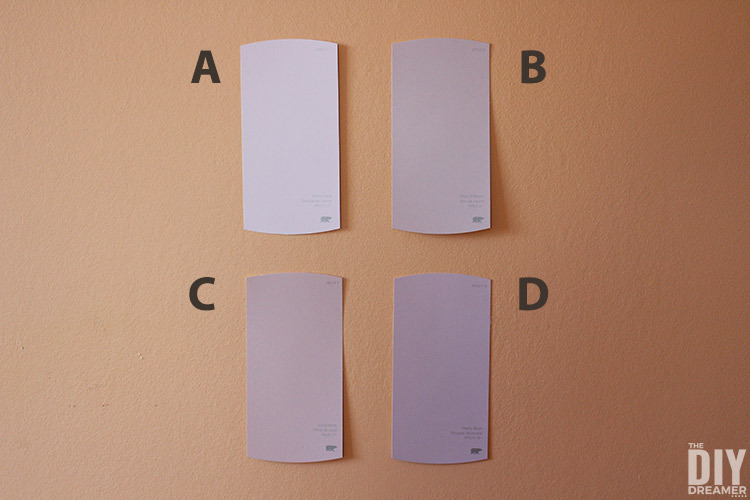 We moved the paint samples wall to wall as the lighting is a little different on each wall. We each voted secretly on the bedroom colors we liked. Gabrielle and Sébastien both voted for the same color. They did not choose the same color as I did (I should have asked Emanuelle to vote too, she may have chosen the same color as me!). I decided to put my big girl pants on and agreed to go ahead with the paint color they picked. The color is really nice, however I thought it was going to look too light when the sun would shine in her bedroom. Which one would you have voted for? I’m curious! Seriously though, I honestly think the best choice is to go with the color that Gabrielle chose and just go with it. She will be happy and in return, we will be happy seeing her proud of her room. 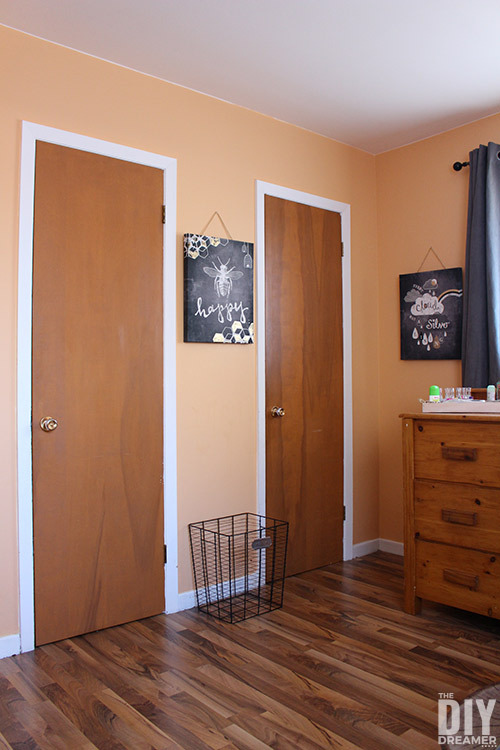 Swing by next week to see what color we went with and how it looks in her bedroom! Hey Leah!! Hope you are doing well! “D” is such a great color!